Galerie m Bochum is currently showing New Photographs by Aino Kannisto, the second solo exhibition dedicated to the work of the Finnish artist, born in 1973 in Espo. Aino Kannisto’s photographs stage fictional scenes in which she herself plays the main roles and takes on various identities. In a fascinating way, she combines sometimes enigmatic, sometimes everyday settings with a subject posing therein to generate a disquieting atmosphere infused with latent tension. Captured at the photographic moment when space and time stand still, the moods of unresolved fear, grief, despair as well as longing and inner contemplation evoked by these scenes confront the spectator with haunting intensity. In the process, Kannisto draws on familiar-seeming references to ordinary situations, to literature, film and photography, as well as to elements more difficult to localize – memories, dreams or fantasies. The artist evinces an enormous empathy for the psychic states of the figures she portrays and their intense presence in the dramatizations of emotional borderline situations or moments of intimate revelation: a pregnant woman in a nightgown leaning against a white wall with beads of perspiration on her face and an otherworldly gaze, or the woman swimming in the middle of a lake, enveloped up to her chin in the deep blue of the water surrounding her and the darkening sky above. With a nervously anxious, distrustful gaze, furrowed brow and slightly open mouth, she is staring fixedly at something outside the picture frame. In extreme close-up, the viewer faces her eye-to-eye, finding him/herself directly confronted by the tension-charged, frightening situation. But what it is she’s looking at, the reason for her anxious expression, remains hidden. What results is an uneasy feeling, a moment of intense, unresolved tension. Contributing to the vivid impact and haunting atmosphere of Kannisto’s scenes is her meticulous attention to the details of the composition. The fall of light, the use of color, the arrangement of the setting, the links between interior and exterior space, the figures’ clothing, their positioning as well as that of the viewer, are all used deliberately to create the desired effect. The interplay of revelation and secret, familiarity and strangeness, proximity and distance, reinforces the suspense of the unsolved riddle posed by each picture. 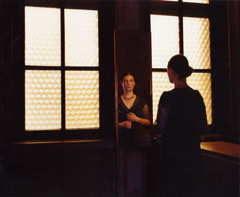 Concurrent with her solo exhibition at Galerie m Bochum, Aino Kannisto is also taking part in a show entitled Self-Timer at the Kunsthalle Fridericianum in Kassel, on view until February 26, 2006. From March 31 to May 7, 2006 the exhibition series Between Dream and Reality – already shown in Ratingen and Bergkamen – will continue at the Galerie der Stadt Tuttlingen. Further projects planned in the course of the year include participation in exhibitions at the White Box in New York, the Kulturhuset in Stockholm and, for the FotoGrafia photography festival in Rome, at Museo Andersen.